Traveling tales and adventures in dance, theatre, art and culture. 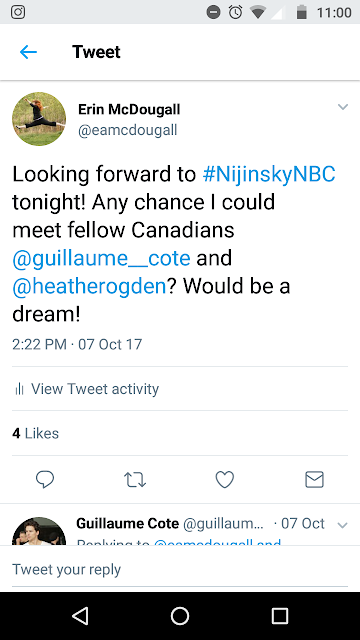 When the National Ballet of Canada announced it was going to tour Paris this fall, I couldn’t wait to cheer on my fellow Canadians in the City of Light. One of my family members even suggested that I wear my Team Canada jersey to the ballet. 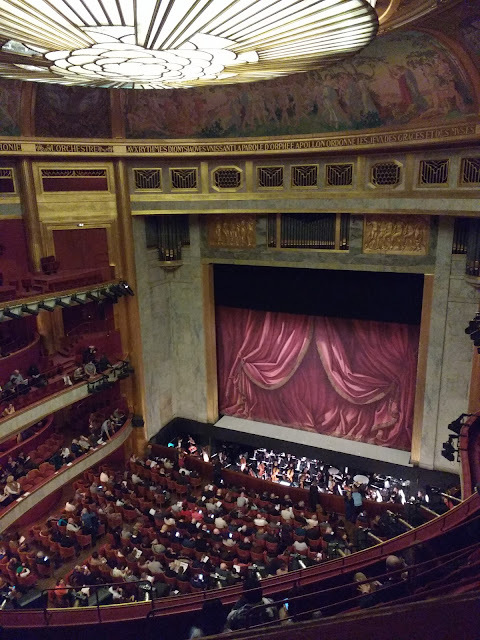 A fun thought for sure, but I bought a new dress instead – two actually – because it’s not every day the celebrated ballet company from my home country comes to my adopted home, to show Parisian audiences how we dance in the True North Strong and Free. NBC’s production of Nijinsky was a poignant choice for their first performance in Paris in 45 years. Choreographed by John Neumeier, it chronicles the life, the brilliance and the struggles of the great dancer Vaslav Nijinksy, who rose to stardom with the Ballets Russes in Paris in the early 1900s. Performing on the stage of the Théâtre des Champs Élysées, where Nijinksy himself danced and where his own ballets were performed, added an extra layer of significance for this momentous tour. 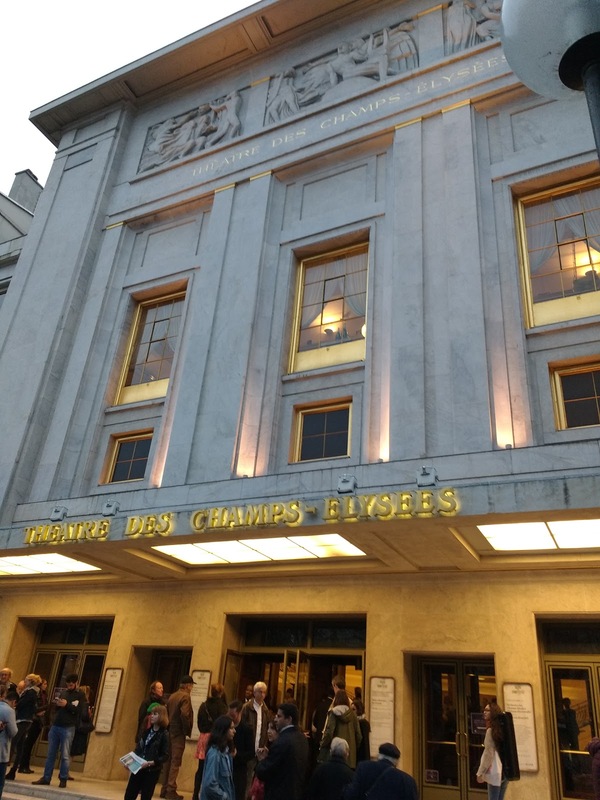 Théâtre des Champs Élysées is in the heart of the 8th arrondissement, on the upscale Avenue Montaigne. It is a beautiful, intimate theatre space, perfect for such an emotionally charged production as Nijinsky. It also doesn’t hurt that the glittering top of the Eiffel Tower is in full view from its front steps. The ballet opens in silence as theatre goers from 1919 gather to witness a performance by the man of the hour. He arrives wrapped in a white sheet, his gaze unresponsive, emanating an air of mystery and melancholy as audience members on both sides of the stage wait for him to come to life. The chair he sits in and the theatre set around him anchors the ballet in a specific moment in time, perhaps one of the last performances he gives before spending the rest of his life in and out of mental institutions, and we revisit this place at key moments in the ballet. The ballet is a kaleidoscope of memories and defining moments from his life. We see glimpses from his performance of the Golden Slave in the controversial Scheherazade, based on the One Thousand and One Nights, Le Spectre de la Rose and his own ballets Jeux, and The Rites of Spring. The dancers flit in and out like shadows, representing the choruses and the various characters from Nijinsky’s life on the stage, as well the rigid society, his adoring public and the ravages of war. When the theatre set reappeared with its audience clapping and cheering in slow motion as soldiers marched and fell among them at the end of Act One, the effect was chilling. The juxtaposition of the slow motion against the feverish speed of Nijinsky’s solo struck me as a powerful way to depict events set in motion, beyond anyone’s control and his powerlessness to stop his mind from breaking down. It was a dream to see the starring roles of Nijinsky and his wife Romola danced by the National Ballet’s superstar and real-life couple Guillaume Côté and Heather Ogden with intense passion, chemistry, fire and heartbreak. Nijinsky’s conflicted, intoxicating relationship with his mentor and lover Sergei Diaghilev, founder of the Ballets Russes, is also highlighted, danced with power and menace by the formidable Evan McKie. Guillaume Côté was magnificent. Nijinsky’s climactic solo, at the breaking point of his mind, is difficult to watch as he literally throws himself around the stage, the impact of his body hitting the floor reverberating through the theatre, yet he executes every movement with total control and precision. His characterization is impeccable as he blends his physical strength with a sharp vulnerability through his piercing eyes. Heather Ogden is the perfect counterpoint. Her lines are long and fluid and her flawless jumps reveal a stubbornness to match Nijinsky’s intensity, but her facial expressions and lightness in her footwork expose her fragility. To say it was a special evening would be a huge understatement. The energy in the theatre was tremendous as the audience demanded multiple curtain calls. There was a sense of welcoming the National Ballet back to the international stage after far too long a hiatus. It was thrilling to be part of that historical crowd. 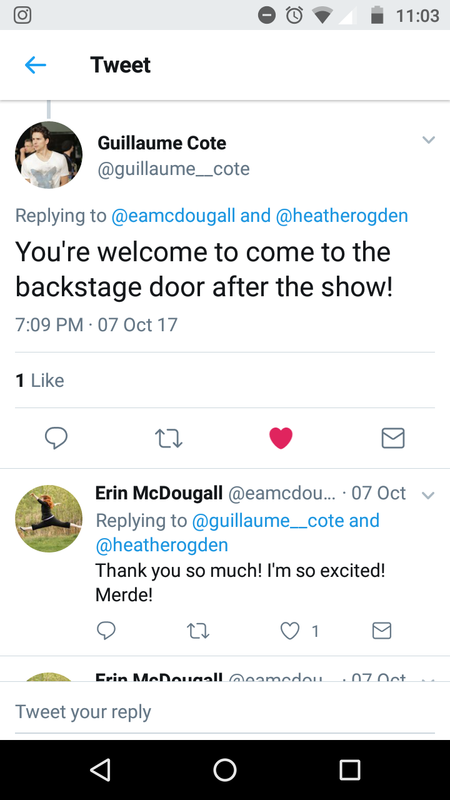 Then, the evening culminated in some very special introductions after the performance…when I met the stars of the show, Heather Ogden and Guillaume Côté! In the lead up to that incredible Saturday night, I was tuned into my Twitter feed to catch snippets of the touring process, such as the short video of Evan McKie standing outside the Canadian Embassy, just up the street from the theatre, beneath the fluttering Canadian flag. And as always, I made sure to watch as much of the World Ballet Day live-stream as I could. Whenever I was out in Paris, I kept wondering if I would bump into any of the dancers and how cool it would be to meet them. Then I realized, why not just ask? If I did nothing, I’d have no chance. But if I asked, what was the worst that could happen? I might get a no, but at least I’d know I did everything I could. We did some quick re-con during intermission to find the backstage door and after the multiple curtain calls ended, we made a bee-line for it. There they were backstage, getting congratulated by none other than Karen Kain. The Karen Kain. The legend herself who put the National Ballet of Canada on the international map as the greatest dancer to come out of Canada; who now is the company’s fearless Artistic Director, whose mandate is to the bring NBC back to the international stage; whose farewell tour poster adorned the wall of my childhood bedroom; who I saw speak in 2005 in Edmonton when the Northern Alberta Jubilee Auditorium was reopening with a performance of Swan Lake. She was hugging the other superstars I’d been invited backstage to meet. It was almost too much for this dancer abroad. But I pulled it together and introduced myself to Heather Ogden. 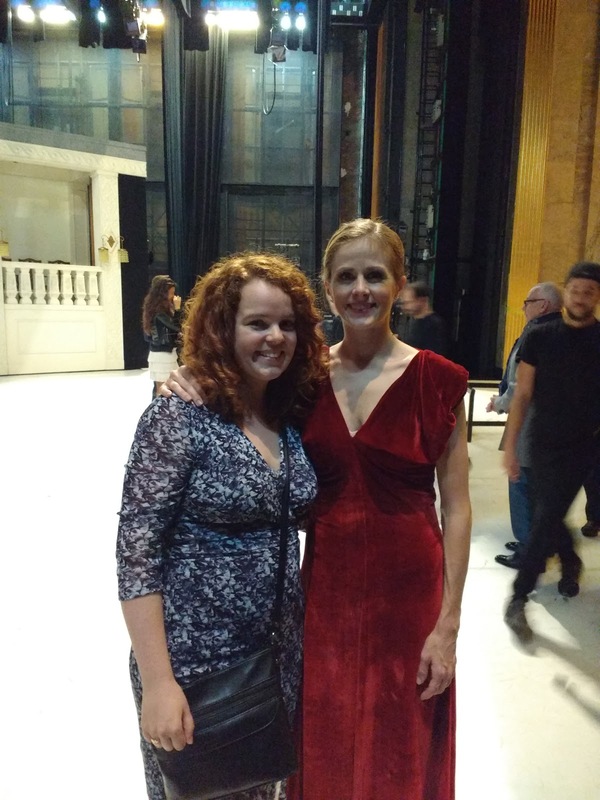 We chatted for a few minutes about the show, how she and Guillaume were enjoying Paris with their 8 month-old son who they’d brought on tour, and how inspiring she is to me, as a dancer-mom myself. When I introduced myself to Guillaume Côté, (“Hi I’m Erin, the one who tweeted you before the show…?”), he immediately thanked me for coming and talked with me for a full five-minutes. 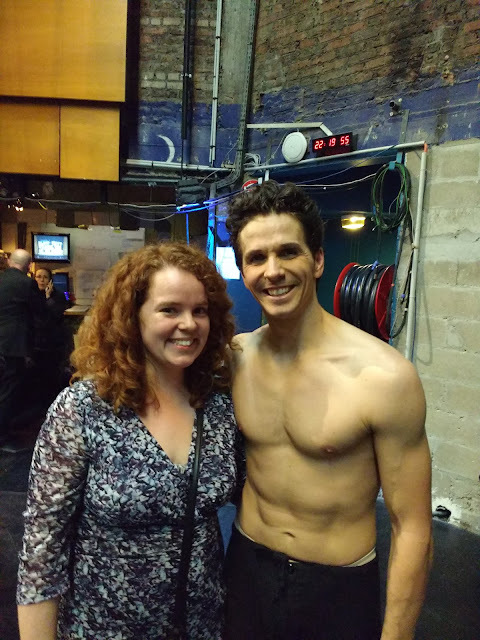 I somehow managed to be coherent enough to tell to him how much I loved the show and his performance, and about teaching dance in Edmonton before we moved here. 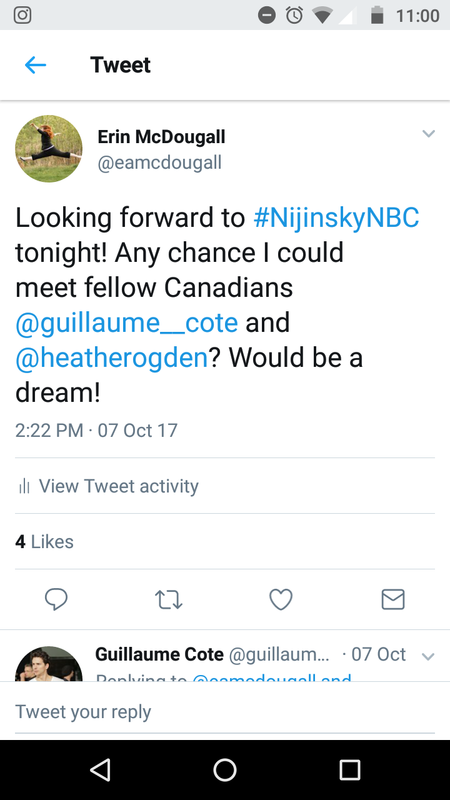 “Next time you’re in Toronto, come say hi!” He said. You bet I will. I am a fan for life! The generosity of these two artists after such a physically and emotionally gruelling show was incredible. They are true ambassadors for the arts and for Canada and I’m so grateful I was able to thank them for their work. I didn’t get the chance to meet Karen Kain, but meeting two out of three stars is a pretty good score. The National Ballet of Canada returns to its home stage at the Four Seasons Centre for the Performing Arts in Toronto with Nijinsky November 22 – 26, 2017. If you have the opportunity to witness this spectacular ballet, take it. You won’t be disappointed. And when you’re there, be sure to tell the dancers I said hi from Paris, with love. The Zen Travellers have Moved!